This story begins with the owner of All That Glitters meeting up with a California rough dealer in mid-July 2011 at a show in Massachusetts. This rough dealer has been known to All That Glitters for decades, having met in the late 1980s. He was attending a show in New England and Mr. Brown, the owner of All That Glitters, decided to drive out to talk with those in the trade to see how business was and if there was any gemstone related news. Mr. Brown showed this dealer a fine large Ruby which the other dealer thought would wholesale for about twice the current asking price. The conversation continued and Mr. Brown moved on to see other dealers he knew, to browse items that were being sold and also to view the mineral specimens on display in this particular show. After a few hours, it was time to leave but what seemed to be a familiar face in the crowd was spotted in the distance. This was a gemstone dealer and cutter from CT whom Mr. Brown had offered to split a booth back in the early 1980s. Though he they had conversed on the phone and emailed, a conversation in person hadn't occurred in perhaps 15 years. Mr. Brown sought him out on the floor and found him talking to that original dealer from CA. Conversations between all three individuals began, and in spending more time there, a discussion began on a few pieces of Spodumene (Kunzite) from CA. 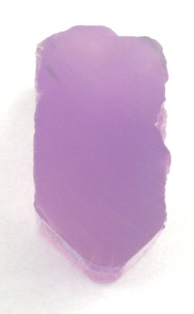 The dealer had obtained two crystals of Kunzite directly from the mine, with the first one being sliced for cutting and the 2nd crystal was still intact but was going to be sliced also. The color of this material was good, had clean sections and was from an important pocket called the Big Kahuna II, found only several months back in an actively worked mine called the Oceanview Mine in the Pala area of CA. Mr. Brown was on his way out of the show, but through odd events, he stumbled on to something unique and that he felt comfortable putting into inventory. Gemstones from the United States are actively sought out by collectors, and if this one piece of rough Kunzite could be fashioned into a beautiful gemstone, this would become an important gemstone due to several factors. Subject of the email: Finished the Kunzite and its Fabulous!! Well its finally finished and it's spectacular!! I can't wait to see this in natural daylight as it's very brilliant now in the lighting in my apartment and this just glows in a very darkly lit view, the color is outstanding a purplish/bluish deep pink. I'd say after looking at the Guide and having this stone cut by me I would say it was valued around $200+/ct wholesale, which would make it at least a $3,770 stone. Our email to this institution was forwarded to the volunteer curator of the gem and mineral collection, Mark Mauthner, who also happens to be involved with the folks at the Oceanview Mine. The fact the company name was All That Glitters and that a really nice looking gemstone from this mine was being offered for sale, raised some flags for a number of reasons, including the fact that little rough had been sold or released. Wearing both his Museum and Oceanview Mine hats, Mark contacted Mr. Brown to make a few inquiries. When the origin of the piece of rough was revealed and other details discussed, what was probably expected to be a short conversation ended up lasting about an hour as the conversation spanned everything from gemstones, photography, travel abroad, minerals and people that were known by both. In discussing the mine itself and the fact that Mr. Brown would be in the All That Glitters CA office in a few more months, an invite to visit the mine was extended. Mr. Brown drove from Northern CA down to the San Diego area (while on route to the Tucson Show) where he got a personal tour of the All That Glitters exhibit in the San Diego History Museum just prior to the doors opening officially for that day. Later, it was off to GIA Headquarters in Carlsbad to view the museum they have just off the lobby. 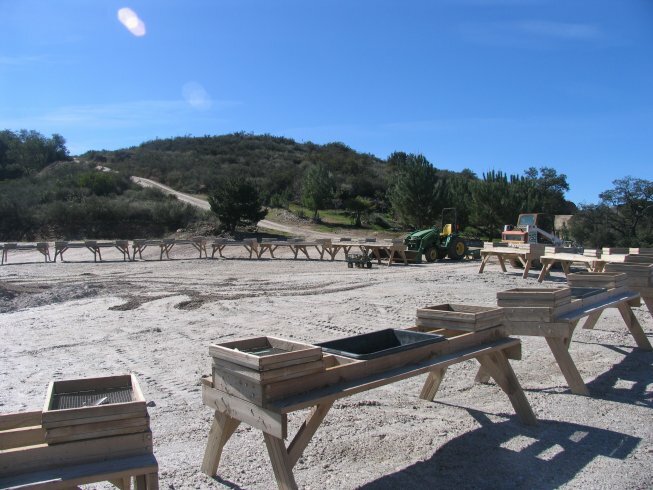 In early afternoon, we drove up to the Oceanview Mine in the Pala area. 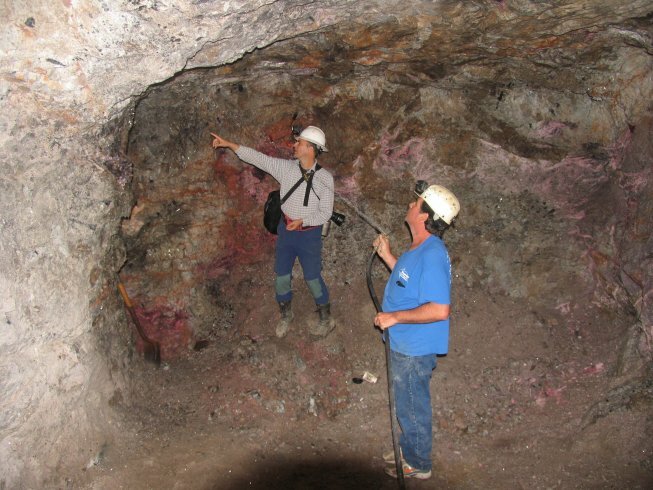 The first thing that one encounters in the vicinity of the mine, is an area where people can pay a fee to sift through rock removed from the mine; there are a number of species to be found. Later in the day we saw this material outside of the mine awaiting removal to the the sifting area, and there were Spodumene Crystals visible - so it seems that one can certainly find some interesting pieces. The sifting area also has water and rest rooms. After Mark discussed what goes on in the sifting area, we awaited Jeff Swanger(the mine owner) to arrive. 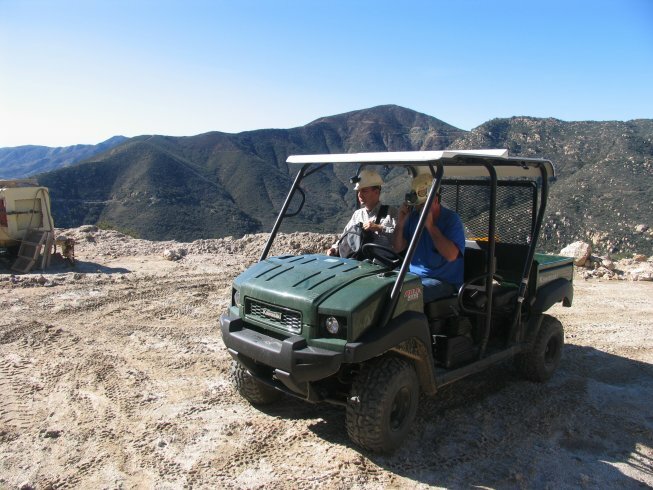 Once Jeff arrived, we took a small vehicle up to a residence on Chief Mountain that overlooks the hills, many of which contain mines; in fact, it overlooks some of the mines mentioned earlier. On a clear day, one can see the Pacific Ocean from here - thus the name, Oceanview. (Just below this residence are the original Pala Chief Mine tunnels and another residence related to the site, currently being renovated; this looks like it will be a great place to stay in the future for those that might be mining or prospecting.) Mr. Brown was shown both Kunzite (Pink Spodumene) and Triphane (Yellow Spodumene) crystals. There were also some pieces of local Tourmaline rough recently purchased from an older gentleman who had mined the area decades earlier (some of this material was from the Stewart Mine - famous for it's Pink Tourmaline, which is rarely clean, but very sought after). We put on hard hats and then drove the vehicle down to the very much anticipated Oceanview Mine. 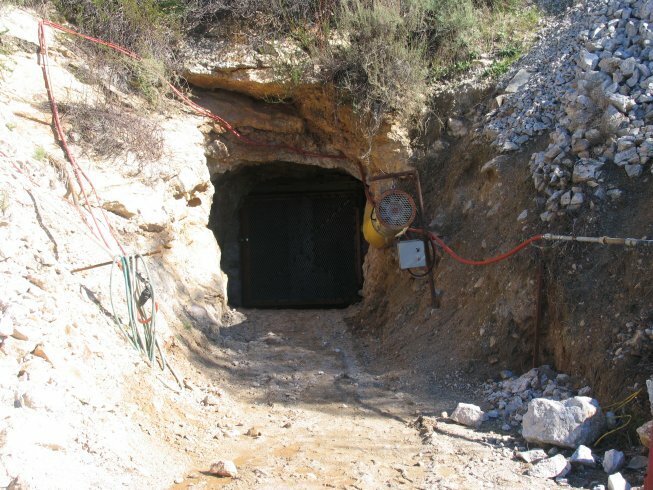 After unlocking the gate to the entrance to the mine, all three entered the tunnel, walking through an area that had been the Big Kahuna and Big Kahuna II pockets and ended up at the far back where active mining was occurring. There were a number of raises and pockets during the walk to the face. (Note: the working area of a mine is known as the "face" or "heading", the "back" is the roof.) Jeff was very excited about the face as it showed VERY good signs that something could be encountered shortly. He wet down the walls to allow better viewing of the material in the walls. The largest area of lepidolilte that Jeff had seen was off to our right - measuring about 6 feet wide. Decomposed Spodumene littered the walls. Picking off some small fragments of the wall, one could see Watermelon Tourmaline. Small digging tools clung to the wall where a miner had left them the previous day. Mark agreed with Jeff in that something good could be around the corner (or at least several feet further) after some more blasting was due in the following days. One can also see the yellow tubing in some areas that brings in clean air from the outside. As our small group of three headed out, a pocket to the right showed crystallization (large smoky quartz clusters) with the potential of other material being found just further in. Pala Chief Mine was next to visit and that was back up and around the hill slightly. Again, after opening the locked steel door, we entered an adit on the second level, just down from the residence we were previously in. The view from this area overlooks the same area as the residences just above. Muck (blasted rock) from these workings sat just outside awaiting removal down to the public sifting area, and if one looked carefully, Triphane crystals were visible. 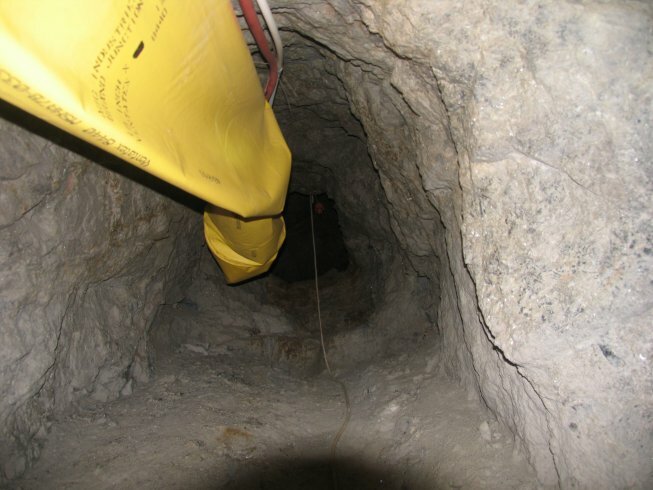 This adit is not as long as the Oceanview but is also being actively mined. (Note - an "adit" is a more or less level and straight tunnel that reaches the surface at a "portal". A departure in direction underground, turns the new segment into a "drift" or "crosscut" depending on whether or not the ore body is intersected.) Smoky Quartz crystals were to be seen here also, and tools were left in place from the last time someone was literally exploring what had been unearthed. There are high hopes for this mine also. The Pala Chief is world famous for the Kunzite specimens it produced, which were the world's best until the discoveries in Brazil, then followed by Afghanistan. Kunzite is absolutely gorgeous in color, being a deep purple blue down the C axis, and greenish and light purple down the A and B axes. 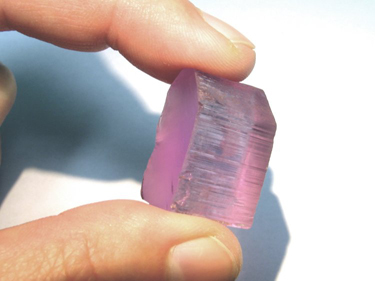 Like most (if not all) naturally occurring Kunzite, the intense color fades over time with exposure to light, but apparently the material found in the Oceanview mine in the last few years stabilizes once it has turned pink from the original purple, green/purple or greenish. Mark has had pieces from the Big Kahuna find sitting in the sun since its unearthing in the summer of 2010. It has not changed from the pink it achieved within a couple of days of sitting in the full sun. However, Kunzite has always been an 'evening' gemstone and limiting its exposure to the sun (UV light), the color will be fairly stable. It is Ultraviolet light that will cause it to lighten. There are a number of gemstones can fade upon exposure to sunlight after seeing the light of day after millions of years - and that can include Amethyst, Topaz among others. To quote some information found on line - "Kunzite is a relatively recent gemstone, having been first discovered in the 20th century. It was first found in the pegmatites of Pala, California, in 1902, and is named after the famous mineralogist George F. Kunz who first identified it. Though it wasn't until the 1990's that this gemstone became a more mainstream gemstone, having been used only as a collectors gemstone prior to that time. Kunzite is a very attractive pink gem, but is notorious for its habit of color fading in prolonged exposure to strong light. Although the color-fading effect is very slow, most people still prefer to wear Kunzite jewelery in the evening to avoid sunlight exposure. 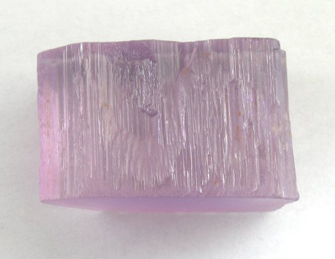 Kunzite is regarded as an evening stone for this reason." Mark has noted "the dark purple Oceanview fades within hours in the full sun to pink and then is stable. 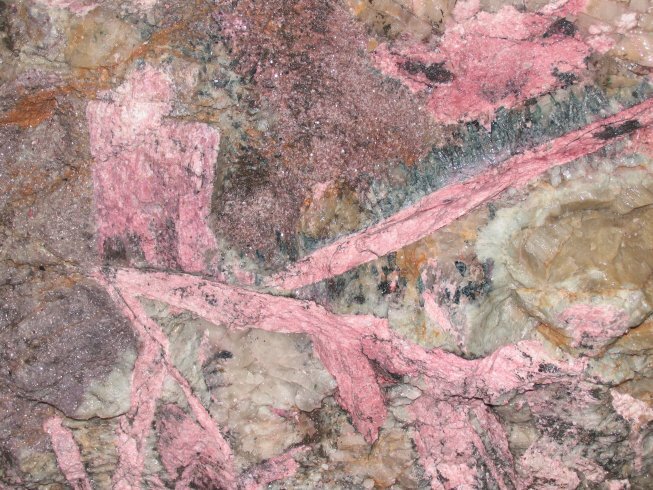 Pink Afghanistan material fades completely over time to colorless." Many Kunzites on the market owe their color to irradiation which produces a medium pink color - just another of the many forms of enhancement that gemstones may be exposed to and many times without disclosure. Kunzite (and all colors of Spodumene) has cleavage like Diamond, Diaspore, Topaz and other gemstones. This particular gemstone would be best to wear as a pendant. Little rivals the beautiful color pink of the various saturations of this gemstone. With some care, the original color can be maintained and this beautiful gemstone can be passed on to future generations. Many thanks go out to Mark's hospitality that I was shown during my whirlwind tour of the Natural History Museums All That Glliters Exhibition, as well as GIA's museum; a tour of the Oceanview Mine as well as the Pala Chief Mine would not have been possible without Mark's help and guidance. 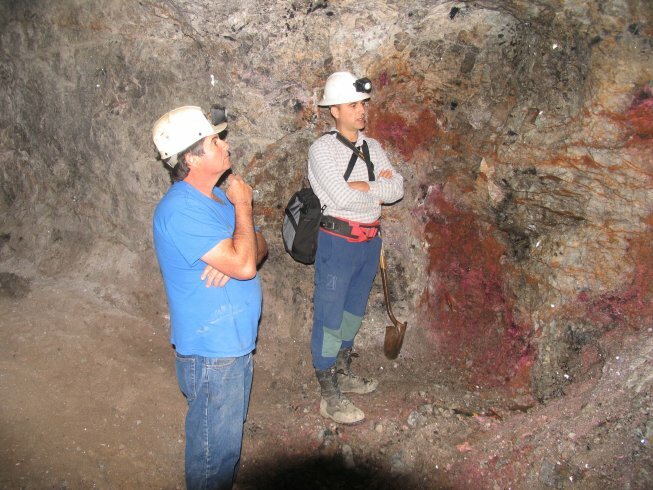 Special thanks also go out to Jeff who owns these mines and whose insight and information during my tour is priceless. I look forward to hearing about future finds. One never knows what is just a few feet further as the miners on Chief Mountain continue into the gem/mineral bearing rock. 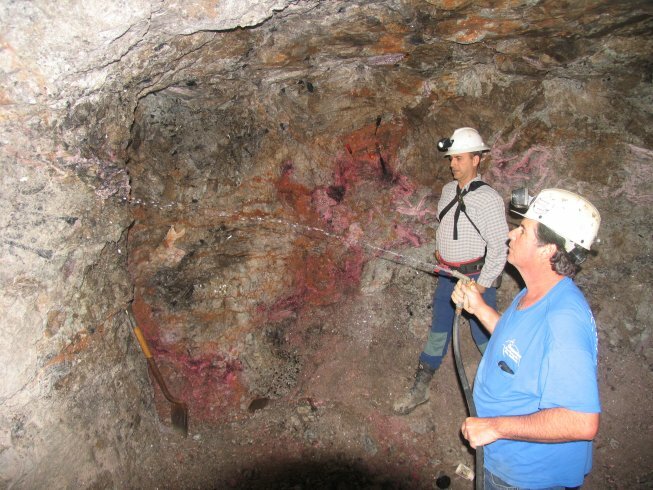 Hiriart Mountain: White Queen Mine, Katerina Mine, Vandenberg Mine, San Pedro Mine, Anita Mine, Fargo Mine, El Molino Mine. China's Dowager Empress Cixi of Qing Dynasty highly prized the pink tourmaline mined in Pala. Under her influence, China's appetite for this gem created a boom in the California tourmaline industry after 1902, particularly at the Himalaya mine, ending in 1911, shortly after the Empress died in 1908. 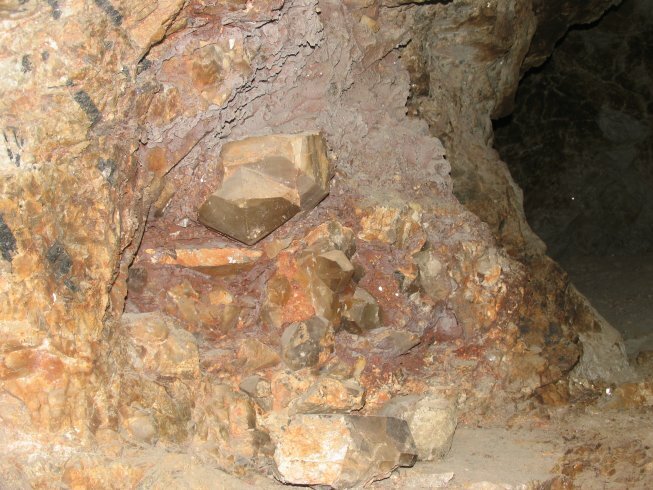 Pala was the site where morganite beryl was first discovered. It was also discovered in 1902 as the first commercially significant deposit of kunzite, named after George F. Kunz, the godfather of gemology. On December 3rd, 2009, another bonanza pocket was discovered... This basketball-sized pocket produced several deep purple and lavender kunzite crystals, the largest measuring approximately 7.4cm wide, being doubly terminated, along with many fine gem-quality green and bicolored spodumene crystal lathes and shards. Nearly all of the kunzite recovered exhibited strong green to purple trichroism. Other accessory minerals recovered adjacent to this pocket included several small pale blue to dark blue-capped tourmaline crystals, lepidolite and cleavelandite. 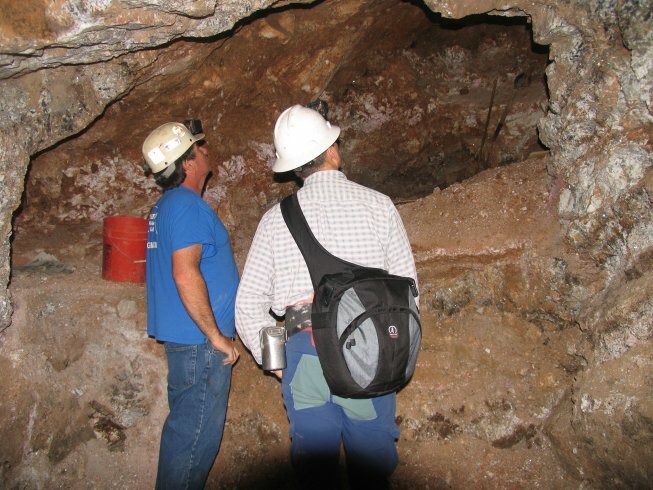 Underground work continued along the zone of lithia mineralization, which led to the discovery of additional kunzite pockets in the spring of 2010. 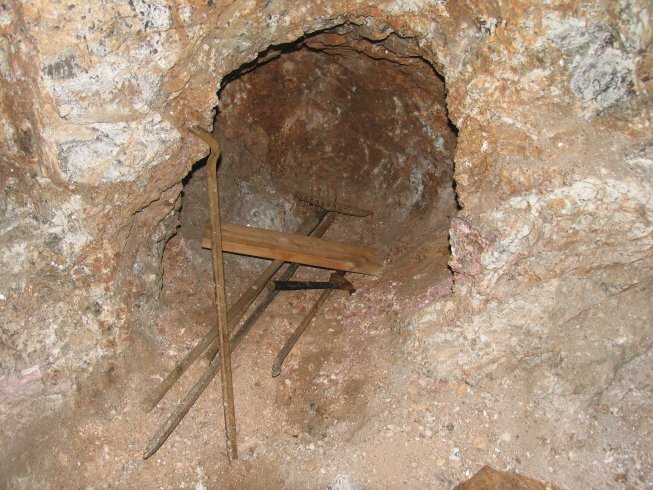 In this area, dubbed the "Big Kahuna" zone in honor of Swanger's father, hundreds of kilograms of gem spodumene were produced, including one large crystal lathe measuring approximately 21cm tall, and weighing nearly one kilogram. Minor amounts of green, blue and pink tourmaline were also discovered, including some fine bicolor pink and green pencils. The largest reported tourmaline found measured aproximately 15cm tall and 3-4cm wide. Additionally, several beryl specimens were also discovered, although beryl was notably rare in this zone. One tabular morganite crystal recovered measured 7cm across, associated with a small "blue-cap" pink tourmaline. 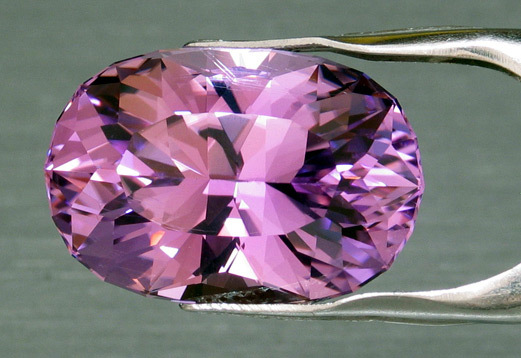 In December of 2010, another large kunzite pocket was discovered down dip from the Big Kahuna zone, and thus named the "Big Kahuna II". Although not as productive in comparison to the sheer volume of material produced from the first pocket, the color of this spodumene was generally a more deeply saturated hue, and exhibited strong pleochroism. 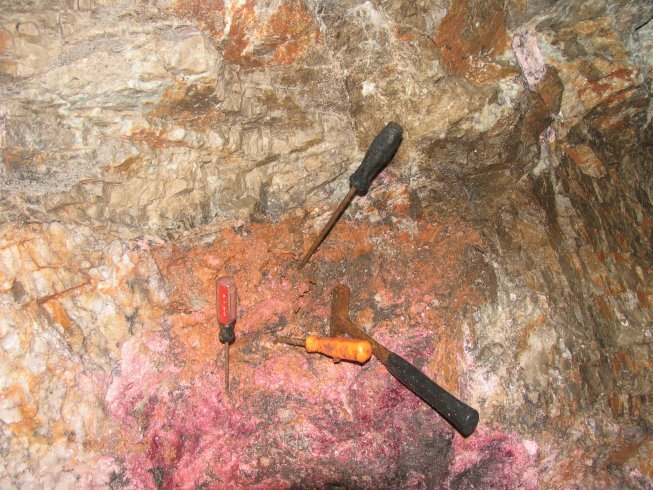 Several deep colored pink and cranberry red color-zoned tourmaline specimens were also found, some associated with a matrix of albite and lepidolite. Adjacent satellite pockets produced specimens of citrine and smoky quartz, some so deeply colored that they appeared black or otherwise opaque. Watch a Kunzite from the Oceanview Mine being faceted over a weeks timeframe.